Airbnb has offered free accommodation to people left stranded by President Donald Trump's travel restrictions. On Friday the president signed an executive order barring immigrants and visitors from seven, largely Muslim, countries from the US for 90 days. Some of the biggest US technology firms expressed alarm over the travel ban. 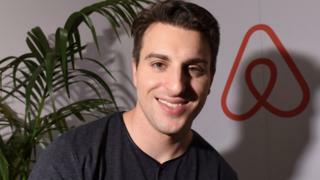 Airbnb chief executive Brian Chesky said the move was "not right" and tweeted that people in urgent need of housing should contact him directly. "Not allowing countries or refugees into America is not right and we must stand with those who are affected," Mr Chesky said. The move sparked dismay among US technology firms which employ thousands of Arab and South Asian immigrants. In a post on Facebook, the chief executive of Netflix, Reed Hastings, said: "Trump's actions are hurting Netflix employees around the world, and are so un-American it pains us all." "Worse, these actions will make America less safe (through hatred and loss of allies) rather than more safe," he added. Earlier on Sunday a US judge issued a temporary halt to the deportation of visa holders or refugees stranded at airports following the executive order. That followed a legal challenge from The American Civil Liberties Union (ACLU). The executive order halted the entire US refugee programme and also instituted a 90-day travel ban for nationals from Iran, Iraq, Libya, Somalia, Sudan, Syria and Yemen. Cab-hailing firm Uber has been condemned on Twitter for not supporting a protest by New York City cab drivers over the travel ban. Uber reportedly lowered its prices during a one-hour protest by the drivers of yellow cabs, during which they did not pick up customers from JFK Airport. Some Uber customers said they were deleting their Uber accounts in protest. But chief executive Travis Kalanick was among those to voice his concern about the ban, saying it would impact "many innocent people" and that he would raise his concerns at a meeting at the White House on Friday. In a letter to employees, Apple chief executive Tim Cook said the president's order was "not a policy we support". "We have reached out to the White House to explain the negative effect on our co-workers and our company," Mr Cook said. Google has recalled travelling staff members to the US after the executive order was signed. The company told the BBC it was concerned about the order and any measures which could block skilled workers from the US. Microsoft sent a letter to its employees offering legal assistance to those affected, thought to be 76, while Facebook's chief executive Mark Zuckerberg said on his Facebook page on Friday that he was "concerned about the impact of the recent executive orders signed by President Trump". "We need to keep this country safe, but we should do that by focusing on people who actually pose a threat," he wrote. Aaron Levie, the founder and chief executive of online storage company Box, said: "The executive order on immigration is immoral and antithetical to our values."